I think of him about the same as I did before - no more, no less. I guess I expected that I would think of him a lot more. But it seems to be about the same amount. Now and then, just like before, he will pop into my head. And now and then, unlike before, I have to stop and remind myself that he is no longer here. But that doesn't cause me to think about him more. It does, however, cause me to feel his absence, which I find interesting since I have been living apart from him for the past 22 years, seeing him for 3 and 4 days at a time, a few times a year. It's not like I was used to being around him all the time or that I saw him once a week or even once a month. But now, somehow, I definitely feel his absence from my life. Perhaps it's the realized finality of knowing I won't see him - his physical self - again every time I go home. He'll still be a priority, but the sense of urgency to see him is gone. Now, he patiently waits for me to show up. It's unfortunate that a human life that you know and love eventually becomes just a name on a piece of granite in a field surrounded by other names on other pieces of granite. But here he will wait quietly and patiently, forever. And eventually, so will she. Just waiting for me every time I go home. As for being home, I was there recently. I made a solo trip to the cemetery and was not prepared for my reaction. It was my first visit since the funeral back in July. It was early in the morning; there was still some fog in the air. The cemetery is a peaceful place on top of a hill in a town on top of a mountain. I parked the car and walked to his plot. And the closer I got the more overwhelmed I became. 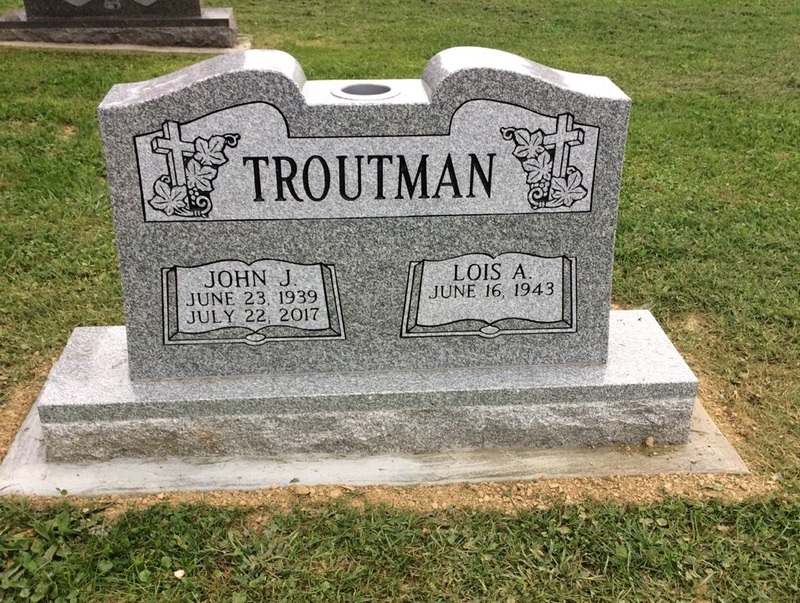 Back in July, we had placed a decorative marker on his plot while we waited for the tombstone to be put in place. Had we not done this, he would literally be laying in an unmarked grave. And perhaps it was the site of this marker that got to me. The plot next to him displays a rather large tombstone, there beside his little marker. I knew his tombstone would come in time, but for a second - a very quick second - he seemed insignificant. And that killed me inside because he is anything but.